The delays and confusion attendant upon organizing and mounting the relief expedition, which included the 4th Defense Battalion and ships that had survived the onslaught against Pearl Harbor, demonstrated the limits of improvisation. As a result, the Marine Corps acted promptly to reinforce the outlying garrisons still in American hands. The defense battalions at Pearl Harbor provided additional men and material for Midway, Johnston, and Palmyra Islands, and defense battalions fresh from training deployed to the Pacific. The war thus entered a defensive phase that contained the advancing Japanese and lasted into the summer of 1942. On 21 January, the 2d Marine Brigade (the 8th Marines and the 2d Battalion, 10th Marines, the latter recently returned from Iceland) arrived in Samoa, along with Lieutenant Colonel Raymond E. Knapp's 2d Defense Battalion. The newcomers built on the foundation supplied by the 7th Defense Battalion and were themselves reinforced by the newly activated 8th Defense Battalion under Lieutenant Colonel Augustus W. Cockrell. The Marines in Samoa anchored a line of bases and airfields that protected the exposed sea routes to Australia and New Zealand, which were judged likely objectives for the advancing Japanese. On 27 May 1942, the 8th Defense Battalion moved southwest from Samoa to the Wallis Islands, a French possession. Tanks, field artillery, motor transport, and infantry reinforced the defense battalion, which remained there through 1943. The stay proved uneventful except for a visit from Eleanor Roosevelt, the President's wife, who was touring the Pacific theater of war. Elsewhere in the Pacific, Lieutenant Colonel Harold D. Shannon's 6th Defense Battalion strengthened the defenses of Midway where, by the spring of 1942, reinforcements arrived in the form of the antiaircraft group of the 3d Defense Battalion, plus radar, light tanks, aircraft, infantrymen, and raiders. The Palmyra garrison was redesignated the 1st Marine Defense Battalion  of which it had been a detachment before March 1942  under Lieutenant Colonel Bert A. Bone, with the detachment on Johnston Island reverting to control of the island commander. During March, the flow of reinforcements to the South Pacific continued, as Army troops arrived in New Caledonia and the New Hebrides, while Marine aviators and Colonel Harold S. Fassett's 4th Defense Battalion established itself on the island of Efate in the latter group. West of Midway Island, between 4 and 6 June 1942, the course of the war changed abruptly when an American carrier task force sank four Japanese aircraft carriers and destroyed the cadre of veteran fliers who had won the opening naval battles of the war from Pearl Harbor to the Indian Ocean. A reinforced defense battalion, though hundreds of miles from the actual sinkings, contributed greatly to the American victory. Since the fall of Wake Island, American reinforcements had poured into Midway. 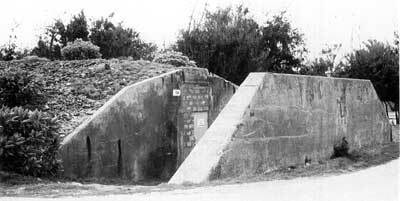 Colonel Shannon's 6th Defense Battalion, now 1,700-strong, helped build the island's defenses even as it stood guard against an anticipated Japanese attack. The labor projects included constructing underwater obstacles, unloading and distributing supplies, and building emplacements for guns and shelters for ammunition and personnel. Shannon told his Marines that "Our job is to hold Midway . . . . Keep cool, calm, and collected; make your bullets count." On 4 June, the Japanese opened the Battle of Midway by launching a massive air strike designed to soften the island for invasion. Radar picked up the attackers at a distance of 100 miles and identified them at 93 miles, providing warning for Midway-based fighters to intercept and antiaircraft batteries to prepare for action. The struggle began at about 0630 and had ended by 0700, with the deadliest of the fighting by the defense battalion compressed into what one participant described as a "furious 17-minute action." 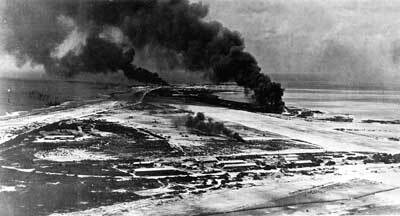 The Marine antiaircraft gunners claimed the destruction of 10 of the attackers, but damage at Midway proved severe, with flames and smoke billowing from a fuel storage area and aircraft hangars. The island's defenders remained in the fight, however, causing the Japanese naval commander to decide on a follow-up attack. His ordnance specialists were in the midst of replacing armor-piercing bombs, designed for use against ships, with high explosives for ground targets, when the American carrier pilots pounced in the first of their devastating attacks. The resistance by the Marines at Midway, both the aviators and the members of the defense battalion, thus helped set the stage for one of the decisive naval battles of World War II. After making this contribution to eventual victory over Japan, the 6th Defense Battalion remained at Midway for the rest of the war. As one of its Marines, Ned Tetlow, pointed out, the long stay enabled the unit to develop a "distinct identity." During the defensive phase of the Pacific War, the defense battalion underwent conceptual changes back in the United States. Two new tables of organization and equipment received official approval in the spring of 1942. One called for a battalion of 1,146 officers and men that had a headquarters and service battery, a 155mm artillery group of two batteries, a 90mm antiaircraft artillery group of three batteries, plus a searchlight battery, and a special weapons group, made up of one battery each of Browning machine guns, Oerlikon 20mm cannon, and Bofors 40mm cannon. The other document called for a slightly smaller composite unit, in which a rifle company and a pack howitzer battery replaced some of the less mobile weapons. Moreover, plans called for one of the composite defense battalions organized in 1942 to be manned by African-Americans under command of white officers.